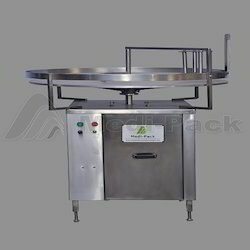 Stainless steel scrambler un scrambler, which is familiar as turn table. This is built on SS square frame, solid guide rail reduction gear box for jerk less noiseless performance. 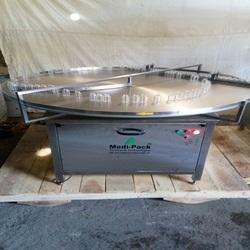 Turntable is useful to ensure total synchronization, uniform flow of container and to take a turn at 90 degree to suit different machine and purpose in automatic liquid line. Net Weight : 150 Kgs. 175 Kgs. 200 Kgs. Gross Weight : 300 Kgs. 350 Kgs. 400 Kgs. ** Can be supplied as per customer requirements. 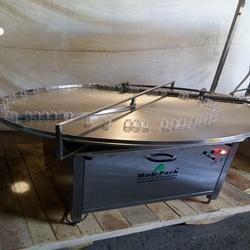 Packaging Details: Description : Stainless steel scrambler & un scrambler, which is familiar as turn table. This is built on SS square frame, solid guide rail & reduction gear box for jerk less & noiseless performance. 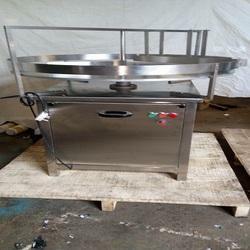 Turntable is useful to ensure total synchronization, uniform flow of container and to take a turn at 90 degree to suit different machine and purpose in automatic liquid line. Operation : Container inputs in turn table by manually or automatic will rotate on disk of turn table and exit through outlet, during rotation of container will guided by a SS strip, which will guide the container towards outlet path.